Meals on a Raft | Eating well, with creative recipes, to follow the Fasting Lifestyle according to Michael Mosley's "Fast Diet." The hash house waitress used to yell, “Adan and Eve on a raft!” when she called in an order of poached eggs on toast. Putting food on some sort of bread-stuff is popular in many cuisines, and some people would say that you can’t eat carbs while dieting. Not so. On the Fast Diet complex carbs are fine in moderation, as long as they are accompanied by lots of protein. Even though this menu has carbs in both meals, the total for the day is 62 g. carbs — far below what is considered ‘usual’ for a day. 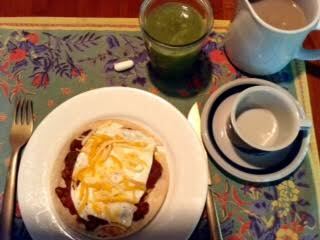 Tostada : 308 calories 7.6 g. fat 18.1 g. protein 39.7 g. carbs GF PB HINT: Use some of the chili non carne [See November 4 posting for recipe] to give this simple breakfast rich flavor. It will keep you going for hours. Combine the tuna, onion, celery, celery seed, and mayo as you would for tuna salad. Toast the bread. 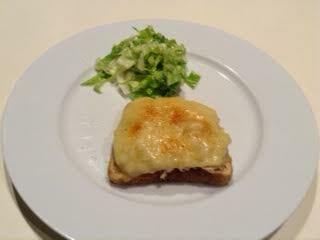 Spread the tuna mixture over the bread and top it with the cheese. Toast or broil until cheese is melting. In a wide bowl, whisk the oil and lemon juice. Toss the lettuce with the dressing and relax while you dine.